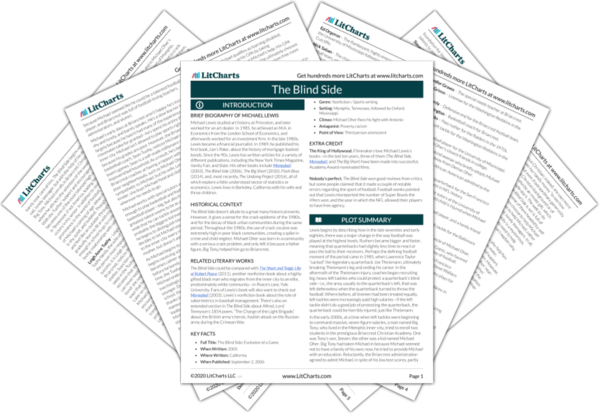 Instant downloads of all 942 LitChart PDFs (including The Blind Side). 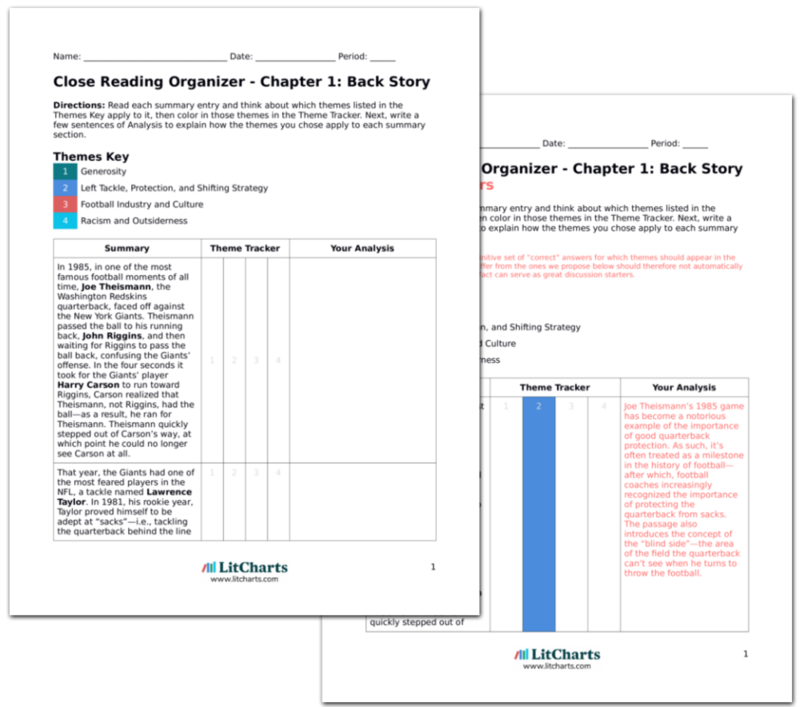 LitCharts assigns a color and icon to each theme in The Blind Side, which you can use to track the themes throughout the work. One day in 2002, a man named Big Tony, accompanied by two teenagers, drives from the west side of Memphis to the east—in essence, from the heavily African-American part to the mostly white area. Big Tony’s real name is Tony Henderson. When his beloved mother died in 2002, she begged Tony to take his own son, Steven, out of west Memphis and give him a Christian education, so that he could become a preacher. Tony is trying to comply with his mother’s wishes and ensure that Steven, a bright young student, goes to a Christian school. Big Tony is a determined man who wants to give his son the education he deserves, even if it means breaking the de facto color barrier that exists in Memphis society. Even in the 21st century, major American cities like Memphis are still, in effect, racially segregated. Big Tony and Steven lived in a house in west Memphis, where a boy named Michael Oher, nicknamed Big Mike, would sometimes crash. Michael had just finished ninth grade, and Tony guessed that he wouldn’t be returning for the tenth. Tony suspected that Michael was going to drop out of high school—in which case he stood a high chance of getting involved in drugs and/or going to jail. So Tony decided to take both Michael and his own son, Steven, to the same Christian academy: Briarcrest. Briarcrest is a de facto white school—very, very few of its students are black. However, Big Tony decides to try to enroll Michael and Steven. In some ways, Big Tony is the person most responsible for bringing about Michael Oher’s later success—had he not enrolled Michael in Briarcrest, Michael probably would never have become a great football player. Some critics have attacked The Blind Side for marginalizing Big Tony’s role in Michael’s life, and even accused the book of “whitewashing” Michael’s rise to success—i.e., focusing too exclusively on Tuohys, the white family that adopted him. The head coach for Briarcrest, Hugh Freeze, meets with Big Tony. Freeze is a deeply religious man, a successful football coach, and a successful girls’ basketball coach, too. He listens as Big Tony tells him about his son, Steven—an honor student—and claims that he’ll find a way to pay Steven’s way through school if financial aid doesn’t cover it. Big Tony introduces Freeze to Steven and Michael, and suggests that they might be able to play on the football team. Freeze is amazed by Michael—he’s never seen someone so big. After laying eyes on Michael, Freeze begins to consider enrolling Michael and Steven in Briarcrest. Another important element of life in the Briarcrest community is Christianity. Many of the characters in The Blind Side are fiercely Christian, and sincerely believe that it’s their duty to help out the needy in any way they can. However, notice that Freeze isn’t sold on admitting Steven and Michael until he lays eyes on Michael and realizes that Michael could be a major asset for the football team—Freeze’s interest in winning games seems stronger than his sense of Christian duty. A few days later, Big Tony delivers Steven and Michael’s transcripts to Briarcrest. Steven is a great student, and he’s accepted on scholarship without further question. Michael, on the other hand, is a poor student—however, he’s clearly going to be a great athlete. Hugh Freeze passes Michael’s transcript on to the school principal, Steve Simpson. Simpson is incredulous: Michael has an IQ of 80, with an “ability to learn” in the sixth percentile. Michael has been advancing from grade to grade, but mostly because his teachers don’t want to deal with him again. Michael has perhaps the least impressive academic record of any private school applicant Simpson has ever seen. However, Hugh Freeze has already phoned the Briarcrest president, a football fan, and told him about Michael’s (presumed) talent, and the president has encouraged Simpson to accept Michael. Simpson, who hasn’t been the Briarcrest principal for long, reluctantly decides to admit Michael, on the condition that he take a home study program for one semester. Freeze is clearly more interested in Michael’s football abilities than his academics. Furthermore, it’s clear that, at Briarcrest, being good at football is more than just another extracurricular activity—in some ways, it’s more important than being a good student. Freeze and the Briarcrest president have some reservations about admitting a student who, the tests would suggest, has severe learning disabilities, but they have no reservations about admitting someone who can help the Briarcrest football team win some games. However, the Briarcrest administration at least tries to ensure that Michael will be prepared for his classes by asking Michael to take home study courses. 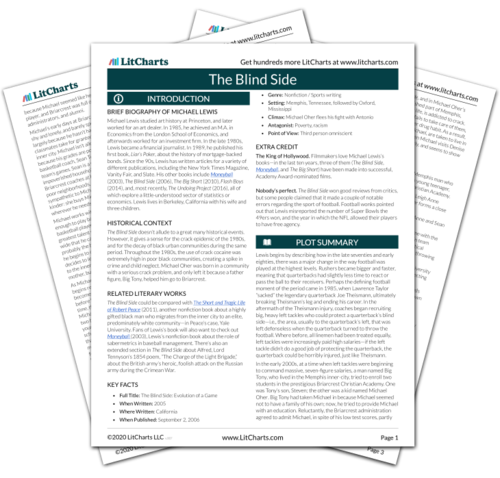 Get the entire The Blind Side LitChart as a printable PDF. Two months later, Simpson gets a call from Big Tony. Michael, Tony explains, has been trying to study for the home study program, without success. Now, it’s too late for Michael to enroll in public school. Simpson realizes that, in trying to be generous to Michael, he’s barred him from getting any education at all. Feeling sympathetic, he admits Michael, but warns Tony that Michael won’t play sports until he raises his grades. Now Michael’s only options are attending Briarcrest or not going to school at all. The fact that Simpson won’t let Michael play sports right away suggests that although football culture is strong at Briarcrest, some faculty there still believe that the purpose of school is to learn, not to play sports. Michael Oher enrolls in Briarcrest’s special needs program. The teacher, a woman named Jennifer Graves, is unsure how to teach Michael—he never talks. She also realizes that he’s never seen a Bible, and that English is “almost like a second language” to him. After noticing that Michael doesn’t say hello to anyone, Graves encourages him to be friendly with children, or else he’ll scare them. Later on, she notices him smiling and shaking hands with a group of small kids. From the beginning of his time at Briarcrest, Michael Oher feels like an outsider. Because he’s spent his entire life around an impoverished, predominately black inner-city population, he has no experience with the wealthy white students at Briarcrest. However, the passage also suggests that Michael is a kind, gentle kid, even if he doesn’t always know how to express his feelings. Within a few weeks, several teachers have recommended that Michael leave Briarcrest—he’s clearly not ready for classes. Even in his weightlifting class, he declines to change into his uniform—all day long, he’s passive. However, Michael’s biology teacher takes it upon herself to go through Michael’s test with him; afterwards, she realizes that, even though he’s quiet, he knows some of the class material. Michael is smarter than his tests would suggest—his problem isn’t that his brain doesn’t work, but rather that he shows no interest in doing anything. As a child, he’s been forced to fend for himself, and has refrained from forming friendships with anyone. As a result, he has no idea how to act at Briarcrest. After school, Michael Oher sits in the stands and watches basketball practice. The basketball coach, Sean Tuohy, notices Michael. Sean is a self-made millionaire, but unlike most rich people in Memphis, he doesn’t have much respect for tradition and decorum; furthermore, he’s uncommonly kind and conciliatory to black Briarcrest students. Once, he brings the entire Briarcrest track team—mostly black students—to the local country club, and lets them cheer for Briarcrest students in a tennis tournament (typically, you’re not supposed to make any noise while watching tennis). Sean Tuohy is one of the key characters in the book: in particular, he’s sympathetic to Michael Oher, and helps him out in increasingly important ways. Unlike many of his colleagues at Briarcrest, Sean is a wealthy white man who doesn’t ignore or condescend to impoverished black people. Sean seems to empathize with the experience of feeling excluded, which is why he invites his predominately black track team to a country club (an institution that, historically, is notorious for excluding non-white people). Sean sympathizes with black students at Briarcrest, partly because they tend to be the poorest students—growing up, Sean was usually the poorest child in school. He played basketball on scholarship at the University of Mississippi, AKA Ole Miss, where he set many records and led the team to its only championship. Sean loved basketball, but he hated the powerlessness of having to play to pay his way through college. After graduating, he turned down an NBA draft to become a businessman. A decade later, he owned a chain of fast food restaurants. Since the restaurants ran themselves, Sean became a basketball coach for Briarcrest. Sean—much like Michael Oher, as we learn later—was a self-made millionaire who parlayed his athletic ability into a vast fortune. The passage suggests that Sean’s drive and ambition—qualities he’d honed as a basketball player—helped him succeed as a businessmen, and, furthermore, that he’s sympathetic to people who also have to work hard to support themselves financially from a young age. One day, during practice, Sean asks Michael Oher what he ate for lunch that day, and asks him if he needs money; Michael says he doesn’t. The next day, Sean, recognizing that Michael isn’t telling the truth, arranges for Michael to get free lunch. A few months later, Sean and his wife, Leigh Anne, are driving by when they notice Michael sitting outside in the snow, wearing shorts. At Leigh Anne’s insistence, Sean stops the car and asks Michael where he’s going. Michael admits that he’s going to the school gym because it’s warm there. Leigh Anne begins to cry when she hears this. Sean continues to support Michael, even after Michael claims that he doesn’t need help. Sean seems to recognize that sometimes people in need don’t want to admit that they’re in need, whether because of pride, fear, or just shyness. Leigh Anne, like her husband, seems to be a highly compassionate person—she’s deeply hurt to learn that Michael is, in effect, homeless, and doesn’t have a warm place to stay. Leigh Anne is something of an anomaly in her community. Unlike some other wealthy white conservatives in Tennessee, she seems not to feel uncomfortable around African-Americans. Notice that Leigh Anne takes care not to make Michael feel that he’s accepting something for nothing—she claims that she’s only helping Michael because she wants the Briarcrest sports teams to look good. She also establishes a symbiotic relationship with Michael, instructing him to protect her while she drives through a neighborhood that’s potentially unsafe (or perceived as unsafe) for wealthy white women. Leigh Anne doesn’t just provide for Michael’s emotional and financial needs; she also takes great care to preserve Michael’s dignity. In the store, Leigh Anne quickly realizes that almost nothing fits Michael—he’s too big and tall. As Leigh Anne tries to convince Michael to choose some clothes, everyone stares at them: Michael is, literally, three times Leigh Anne’s size. Afterwards, Leigh Anne buys Michael food, and gives him extra food to take home. She drives Michael to a house, which he says is his mother’s, and, taking the food and clothing, he says goodbye and leaves. For reasons Leigh Anne can’t describe, she finds herself drawn to helping Michael: he’s so gentle, in spite of his intimidating appearance. On the surface, it seems bizarre that Leigh Anne would go out of her way to help Michael Oher—she seems unlike Michael in every way. Indeed, there is something intangible about Leigh Anne’s sense of moral duty to Michael. However, it’s clear that she feels that her job is to help those who need food, clothing, and shelter. Leigh Anne is especially sympathetic to Michael because she realizes that beneath his tough, stoic exterior, he’s a gentle person. Leigh Anne has some important connections to professional football players—a sign of high social status. The passage is also an early example of Michael turning NFL players’ heads: he’s so big that Ramsey seems to recognize that he could be a great player. Arn, Jackson. "The Blind Side Chapter 3: Crossing the Line." LitCharts. LitCharts LLC, 12 Apr 2017. Web. 22 Apr 2019. Arn, Jackson. "The Blind Side Chapter 3: Crossing the Line." LitCharts LLC, April 12, 2017. Retrieved April 22, 2019. https://www.litcharts.com/lit/the-blind-side/chapter-3-crossing-the-line.